a woman of hope, for a time of crisis and discouragement. Thanks be to God for this saintly daughter of New York, for this valiant woman of God’s Church. St. Elizabeth Ann possessed courage as she stood up for her decision to convert to Catholicism. The accepting and embracing of God’s will– “The Will,” as she called it– was a keynote in her spiritual life. Having lost her mother at an early age, Elizabeth felt great comfort in the idea that the Blessed Virgin was truly her mother. She asked the Blessed Virgin to guide her to the True Faith. The Eucharist, scripture, and prayer were three strongholds that strengthened her faith and nourished her in her mission of Christian formation and education. She had a particular fervor for the Real Presence of our Lord in the Blessed Sacrament. Elizabeth’s early years of marriage to her husband William were to be a brief moment of earthly happiness before the many deaths and partings she was to suffer. Within four years, Will’s father died, leaving the young couple in charge of Will’s seven half brothers and sisters, as well as the family’s importing business. This while Elizabeth was about 6 months pregnant with their third of five children. Eventually both Will’s business and his health failed. He was finally forced to file a petition of bankruptcy. He died of tuberculosis. Their daughters Anna Maria and Rebecca both suffered early deaths, also from tuberculosis. These events only served to draw Elizabeth’s heart nearer to God and eternity. Disappointment, loss, and failure became passageways for God’s grace. Elizabeth read and reflected on Vincent de Paul and Louise de Marillac’s way of teaching and serving the poor. She taught children the articles of Faith, and duties of a Christian life. When her husband’s business failed, Elizabeth needed to provide for the welfare of her children. She remained faith-filled and was convinced that God would show her the way according to the Divine Plan. She regarded her five “darlings” as her primary obligation over every other commitment. She well understood the storm that her conversion to Catholicism would raise among her Protestant relatives and friends– at the time she most needed their help. Indeed, her relatives would likely have provided amply for her and her children had not this barrier been raised. One event that may have finalized Elizabeth’s decision to convert was an action taken by the Anglican Church. At their general convention, held in Philadelphia in 1789, the Anglican Book of Common Prayer was revised. Among the significant revisions was this: the former Book of Common prayer had stated that at communion “the Body and Blood of Christ… are verily and indeed taken and received by the faithful in the Lord’s Supper.” After the revision it said the Body and Blood of Christ are “spiritually taken and received”. The old wording explained Elizabeth’s intense devotion to the sacrament and her eagerness to accept the uncompromising Roman Catholic belief in the Real Presence. For the last three years of her life, Elizabeth felt that God was getting ready to call her, and this gave her joy. Mother Seton died in 1821 at the age of 46, only sixteen years after becoming a Catholic. 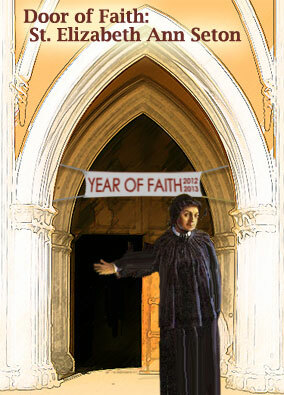 The glorious heritage of Elizabeth Ann Seton is above all an ecclesial heritage of strong faith and pure love for God and for others: faith and love that are nourished on the Eucharist and on the Word of God. Elizabeth said, on her deathbed, on January 2, 1821: “Be children of the Church”. Against her will, and despite the fact that she had also to care for her children, Mrs. Seton was elected superior of her new community of sisters. By the third time she was elected superior in 1819, she protested that it was the “election of the dead,” but she lived for two years more. Do try to prepare your heart to receive our Blessed Lord. Spend… a quarter of an hour in the chapel, to offer your heart to our Blessed Lord and beg Him to prepare it. You know you cannot do it by yourself. In the course of the day, while you work or pray, sometimes think: “Oh, how happy I am! Jesus, my dear Jesus, is coming to me. Oh, dearest Lord, prepare me for Yourself.